VAHPERD's Choose Your Vibe - Arrive Alive! campaign is a social media campaign to promote healthy, alcohol free lifestyles and the avoidance of consequences to health and wellness, academic and career achievement that results from engaging in illegal underage drinking and impaired driving. This webpage provides resources and a timeline for ambassadors to reference throughout the campaign. We want to engage Virginia high school juniors, seniors, and college freshman in promoting and celebrating their alcohol-free lifestyles. We want to promote non-drinking behavior and non-drinking drivers. We want to change the misperception of alcohol use among students. We want the decreasing trends in youth alcohol related fatalities to continue! Social-media savvy students will be recruited as ambassadors to help broadcast @YourVibeVa posts, tweets, and YouTube videos about preventing underage drinking and impaired driving. Ambassadors participate in Twitter chats and post their own messages that support the campaign especially during spring break, prom, graduation, and beach week. Virginia high school juniors and seniors are encouraged to join the current ambassadors and apply to be a 2018-19 Choose Your Vibe – Arrive Alive! Social Media Ambassador by April 27, 2019. Students can earn up to $300 using their social media to share their good driving and alcohol-free choices. Ambassadors who participated in sessions 1-2 will automatically be enrolled in sessions that follow. The Thunderclap service is no longer is operational so we cannot use the tool this year. Instead of completing the Thunderclap campaign event, ambassadors must RT the kick off a spring break (March 20, 2019) and summer (June 21, 2019) messages that will be posted by @YourVibeVA. Ambassadors are asked to encourage their friends to RT too. Twitter chats happen when a group of people all tweet about a topic using a specific hashtag. Five Twitter chats were held during the campaign using the hashtag #VibeVAChat. Three ambassadors will be selected as chat leaders to post preapproved questions to the group. Questions will be posted by May 19, 2019. How do you participate in the Twitter Chat? Search Twitter for the chat hashtag #VibeVAChat at 8 p.m. on the scheduled date. Select the "Latest" tab at the top of the search. You will be able to see all messages posted with #VibeVAChat in real time. To see this in action, watch the Twitter Chat YouTube video (2 min). @YourVibeVA will post a few introductory messages and then three selected ambassadors will post questions to the group one at a time. Try to answer as many questions as you can. You can also like, retweet or reply to other ambassador's answers. Nope! How long will the chat last? The chat should last about an hour. Use #VibeVAChat in all your messages so that your tweets appear in the same feed. 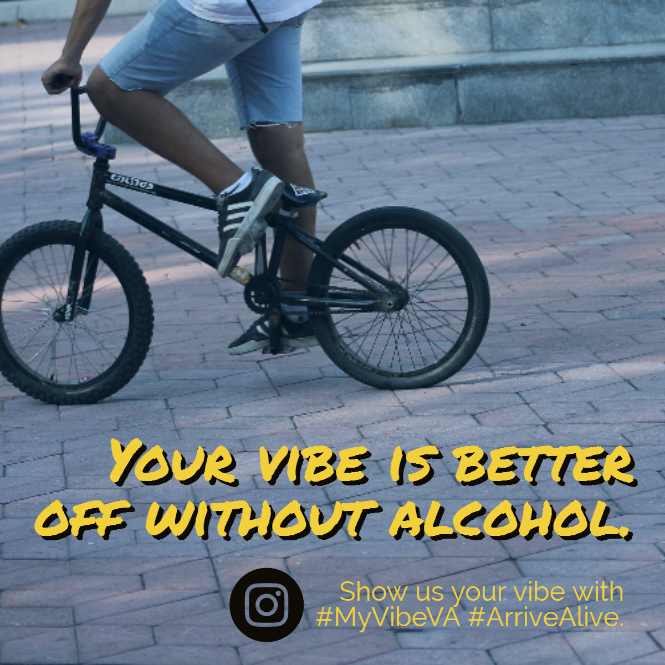 You have permission to use YourVibeVA images with your posts. These images are also available to download and use for your weekly posts. Email YourVibeVA@gmail.com with any questions, concerns or feedback.